As Tunisia marks the anniversary of the start of the revolution, one city with a history of struggle and resistance is celebrating with a street festival for the region’s youth. Kasserine, or the “Castle of Martyrs,” in the words of Sourour Abdallah, one of the town’s young voices, is all but new to revolt and struggle. The city has been central to the liberation of Tunisia since the French colonial era. It was also here that security forces killed 22 people and injured around 200 in the beginning of January 2011. Today, three years have passed since Mohamed Bouazizi’s self-immolation in the neighbouring city of Sidi Bouzid sparked a wave of protests across the country, which led to president Zine El Abidine Ben Ali’s escape. But the people of Tunisia are still struggling with a strained economy and unemployment rates around 15 percent. “Nothing has changed, it is even worse. Nobody cares about this region (Kasserine),” said Abdallah. In Kasserine there is only a small university and according to her the average family struggle financially to send their children to universities in other towns. For these reasons the city seems like the perfect place to host Tunisia’s biggest Street’s Urban Festival. Despite that it is four hours on the louage (mini buses) from the country’s capital, national and international artists including Iraqi-American The Narcicyst and French rapper Médine have come here to engage with the country’s youth. Karim Jabbari, one of the project’s founders, hoped to encourage creativity and self-empowerment. Work-shops of graffiti, slam, hip hop, break dance and photography were scheduled for the event taking place during one of the country’s school holidays. Three teenage girls stand out in a group that to a large degree is dominated by male young aspiring rap, hip hop, graffiti and slam artists. Dance unites them and they are ready to challenge the norm of a woman’s place in the Tunisian society. “It’s a guy’s thing, girls are supposed to stay at home, we want to change that,” Rama Yahyaoui said enthusiastically. All three of them will participate not only in the dance events but also rap, graffiti and slam. However, dance is what they have been doing for the past three years. “If we were from another place we would be famous because we are really quite good,” Nouhen Nasri quickly filled in. They laughed and disappeared, ready to take on the world. Hope, empowerment and inspiration filled the air during the first days of the festival. Rapper Alpha 17, or Amri Seifeddine is hoping that this will be the first festival of many of its kind. “The government wasn’t supportive of this kind of activities.” The festival’s first concert with French rapper Médine was the first of its kind in the city with a crowd of boys and girls of all ages. 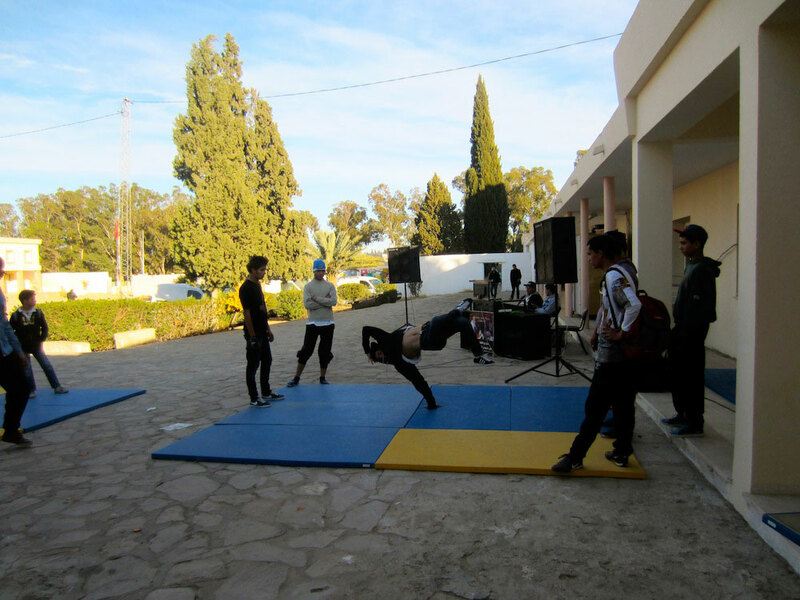 “In Kasserine we mostly perform on the streets,” Seifeddine said and explained that it is usually together with a group of friends and about the struggles of everyday life. To the local manager of the festival, Abdelkader Aloui, it is important to show another side of Kasserine, which is often associated with terrorism around the surroundings of Mount Chaambi.